When you select the Participants tab, the Participants page is displayed. This page gives you access to all the participants in the Onyx database. The Home page gives you one way of finding a participant. The Participants page lets you find a participant in a number of ways. this figure shows the Participants page and points out some of its more important features. The Participants list occupies the lower part of the page. Initially, it is empty, but after you do a search, it is filled with a list of participants. The Actions column contains one or more action links beside each participant. These are the actions you can do for the participant—for example: View their registration information and Interview them. The Page selection links ( ). If the Participants list contains many participants, they are displayed on several pages. These links allow you to view the different pages. 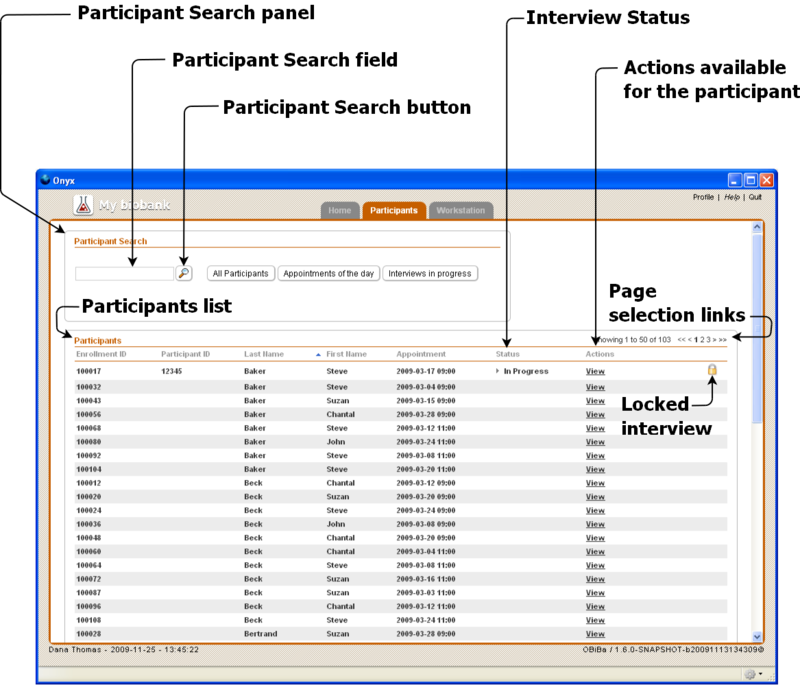 A Locked interview (indicated by a small icon) means that some user is interviewing the participant. See Locked status.